Ergonomic Design: Shaped to reduce pulling and tugging while allowing for maximum mobility. Secure Fit: Mandarin color with hook and loop closure, as well as hook and loop wrist and lower leg adjuster straps and 10” zipper leg closure. Comfortable: Includes elasticized waist adjuster straps. Available Options: Available in different colors and fabrics to suit every need. 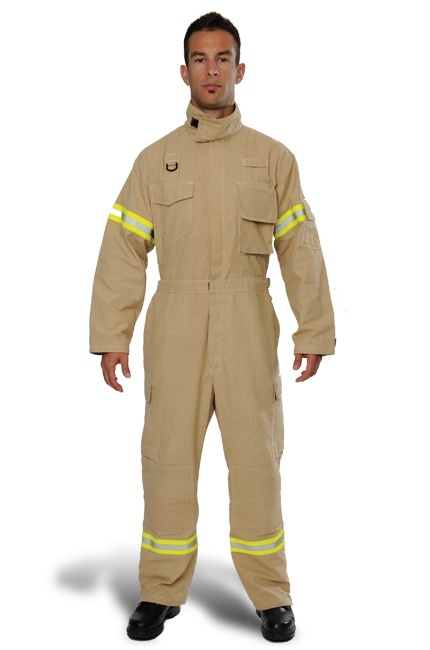 Compliant Capable: Built with flame-resistant, NFPA 1977 compliant DuPont™ Nomex® IIIA fiber (yellow or red) or PBI® Triguard (yellow, natural and cobalt blue). Also available in other materials (yellow, red or navy). Smart Reinforcements: FR, water-resistant Lite-N-Dri™ padding at elbow and knee. Reinforced with an extra layer of outer shell material. Convenient, Secure Pockets: Features hook and loop closure seat pockets, cargo pockets, slash waist pockets, and chest pocket, as well as utility loops. Reflective Options: Available with 3M™ Scotchlite™ Reflective Material on biceps, lower leg and upper back, as well as letters/numbers sewn on the upper back.